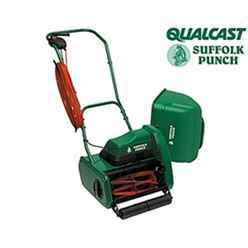 The Qualcast Suffolk Punch 12E electric cylinder mower is ideal for gardeners with small lawns who are looking for the traditional striped finish and scissor like cut. This cylinder mower has a aluminium deck and heavy rear roller that will make light work of mowing your lawn. It has a removable QX™ cassette system for easier blade sharpening and maintenance. This also allows the optional scarifier cassette to fitted which transforms the Suffolk Punch 12 E into a powered lawn rake; leaving you with a moss free lawn. The manufacture of the Suffolk Punch 12E has been taken over by Allett Lawnmowers, a quality British manufacturer, with the price, design and specifications remaining exactly the same, with some like the motor power having been improved to 420watts. The Allett version is called the Allett Classic 12EPLUS.